It seems first strange and then plausible that artists should be inspired by Ludwig Wittgenstein, a philosopher concerned with the limits of language and the clarification of communication. Perhaps it is his idea of language games, with its implications of the elusiveness of meaning and opacity of intent that is the attraction. Joseph Kosuth’s citations of the Tractatus Logico-Philosophicus and the letters of Elgelmann are a good example; Derek Jarman’s film, Wittgenstein, scripted by literary theorist Terry Eagleton, another. Now at the John Hansard Gallery, three artists, Alec Finlay, Jeremy Millar, and Guy Moreton complement each other with a group of works that tries to draw closer to the philosopher. Photographs, wall drawings, objects, videos and poetry are all imbued with Wittgenstein’s aura. The Austrian philosopher, who took a break from ‘doing’ philosophy for some years, often found solace in rural far off places—Norway and Ireland in particular. Skojolden in Norway provided him with the necessary solace for recovery, but has also allowed Moreton to capture the wild and lush rural solace around the foundations of Wittgenstein’s house. The resulting photographs adorning the walls of the gallery are just part of a process—undertaken in tandem with Finlay as part of the research toward the latter’s attempt to recreate Wittgenstein’s house—of moving around the region attempting to follow in the philosopher’s imagined footsteps. Finlay, a poet and publisher as well as an artist, has contributed a pair of wall drawings—made from a Paul Celan quote, ‘I am alone on all roads’—sculpture and word sculpture/games as well as several books. These pieces probably represent the most overt connection to the philosopher in their play with words—one of the games uses a quote from one of Wittgenstein’s notebooks—and biographical references to the Austrian. For example, a sculpture with two scrubbing brushes refers to Wittgenstein’s habit of cleaning his floor with a damp brush and old tea leaves. Millar has created two videos, one about Wittgenstein and one more tangentially related to him. In the former, ‘The Dark Night of the Intellect’, a narrated video—with elements of text from Tim Robinson’s Rock of Ages, a book of essays about the land or at least its geology—provides the voice in which images of Wittgenstein’s bleak Ireland (Rosroe) unfolds. In the second, a view of Millar’s backyard becomes a mini-opera in which birds interact. Though a real-time video, a soundtrack from Brahms’ Clarinet Quintet provides a link to Wittgenstein’s era—the composer was a regular visitor as Wittgenstein’s father was a patron of the arts—and refer to the fact that in one of his breaks, the Austrian spent time feeding birds. What is poignant here is the absence of people. Despite the interactivity of Finlay’s movable language puzzles, there is something forlorn, a sense of abandonment in the images and videos. This feeling of absence may be appropriate when you consider the isolation that Wittgenstein craved, but is ironic when you think that his work highlighted the social dimension of language—the idea that there is no such thing as a ‘private language’. In all There Where You Are Not is a dry show, albeit with a feeling of emotion being held back, as if sadness or loss were all-prevailing; in that way, it may be an appropriate show about the slightly withdrawn philosopher. Ultimately it seems to convey a sense of the rawness of Wittgenstein’s character and perhaps how it contrasts with the refinement he sought to create in thinking. 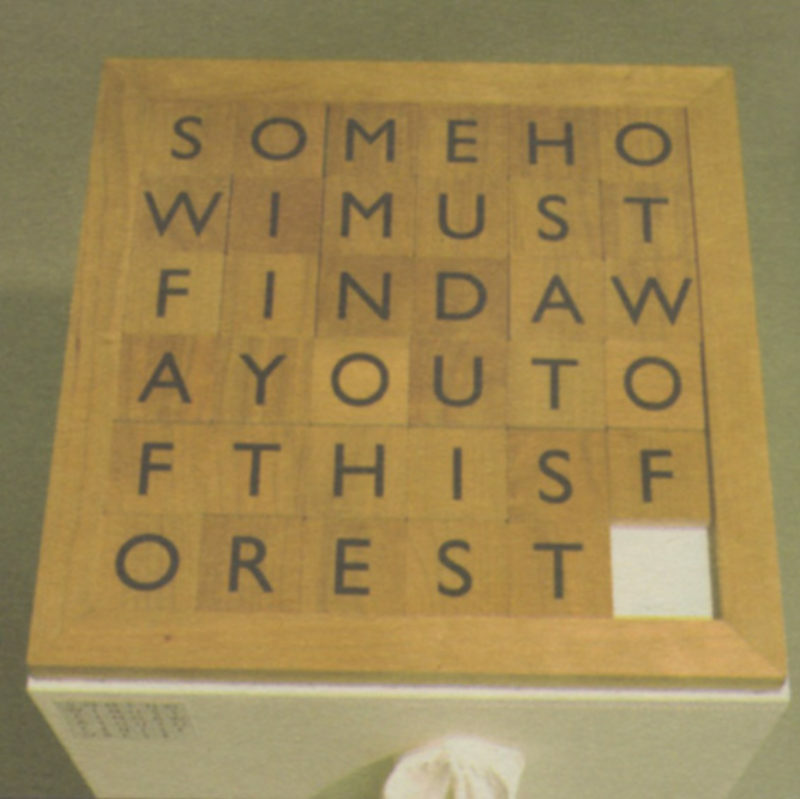 Thus it should be Finlay’s puzzle that has the last word: S-O-M-E-H-O-W-I-M-U-S-T-F-I-N-D-A-W-A-Y-O-U-T-O-F-T-H-I-S-F-O-R-E-S-T.